Brilliant service cant thank enough, dropped bouncy castle a day early with no extra charge, frozen castle was excellent, kids had a fantastic day thank you because my daughter had an amazing birthday party. Hired the Disney mega slide last Saturday for our schools fete for the second year running; exceptional price with good service and times adhered to by the staff for delivery and collection. Would recommend . themed bouncy castle hire liverpool. 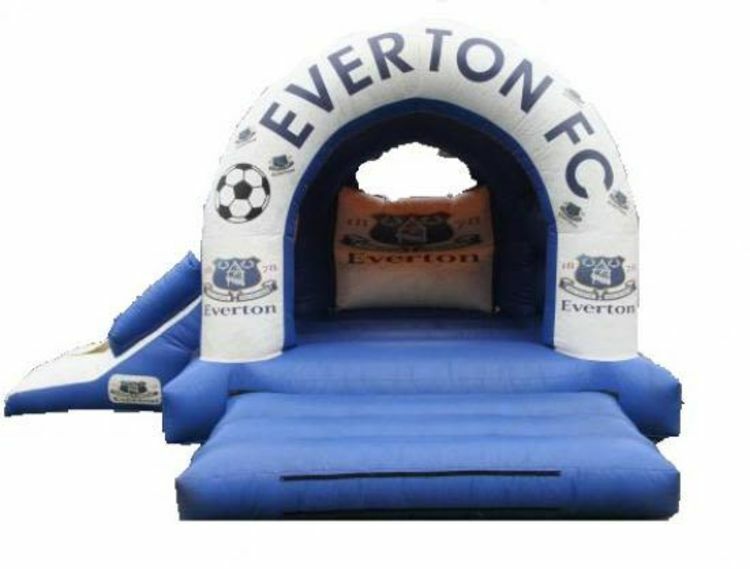 Our 15ft x17ft E.F.C, slide themed bouncy castle is popular with boys and girls and has amazing artwork of the Everton badges on it and has a slide on it for extra fun on you big day.This themed bouncy castle has a showercover so whatever the weather you can still have fun on our Everton slide theme bouncy castle so book on line to save the disappoint of missing out on you fun day.The required space you will need is 17ft x 19ft,the height of this bouncy castle is 12ft.If the bouncy castle is going indoors,please ensure the celing height of the venue where the bouncy castles going is higher than the bouncy castle.We deliver our themed bouncy castles, inflatable slides,rodeo bull hire,plus are assault courses and adult bouncy castles and domes,to Merseyside & Liverpool, Widnes, Runcorn, Wirral,Warrington, and St Helens, and some of these areas and further areas will be a additional fuel charge or toll/tunnel charge.Check our delivery checker on our home page,it will tell you if there is a charge for your area.